Kaitlin McClurg graduated from the Polysomnography Program in 2015 from Alvin Community College in Texas where she became credentialed as an RPSGT before graduation. She continued on and graduated from the Neurodiagnostic Program in 2016 to make herself more marketable. She also received her license as an R.EEGT shortly after graduation. She was able to receive all of her training from the Houston Medical Center throughout both programs. She was presented with the opportunity to tutor the 2016 Polysomnography Program students to prepare them for the boards while she was still continuing my EEG education. The skills and knowledge she gained from her experience in Houston prepared me for situations she would encounter as a travel tech in 2017. 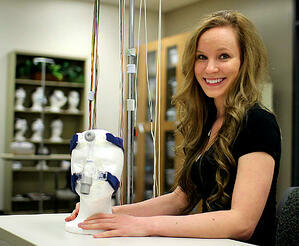 She took a full time job in the sleep lab in her home state of Montana, where she is able to pursue both career paths. How do you feel knowing you’ve won this award? I was ecstatic when I found out. I was shocked that it was me. I almost thought that maybe there was another Kaitlin out there who won! I instantly called my director at my sleep medicine program and told her thank you for everything that she had done for me in school to help me be able to achieve this award. How has being a member of AAST helped enrich your career? I have had more exposure to the latest trends in sleep medicine, where are we headed for the future, and how much more we can help our patients when it comes to their health, proper sleep and CPAP therapy. What would you say to encourage a friend to join AAST? Take advantage of AAST to keep up on what’s changing and evolving in the field. You also get to keep up on your CEUs for your license. What inspired you to pursue this particular career path? When I was in college in Wyoming, I had a director who introduced me to sleep medicine. I thought it sounded interesting and something not many people knew much about. I wanted to help others, and I knew I could achieve that through this branch of healthcare. It has been an rewarding career path because I have been able to help my father receive the CPAP therapy he needed due to his cardiac history. He is my inspiration when I talk to my patients and how sleep medicine can improve their health. What do you hope to accomplish in the future with sleep medicine? Do you have any one area of interest/expertise? I hope to be able to work with patients on CPAP compliance and education. I feel there is a lack of proper education to help patients continue their therapy in the long term. This field is starting to focus more on prevention and long-term solutions to help patients understand the importance of treating sleep disorders. I would like to be able to help bridge that gap between doctor and patient more so there are less questions, confusion and worry.